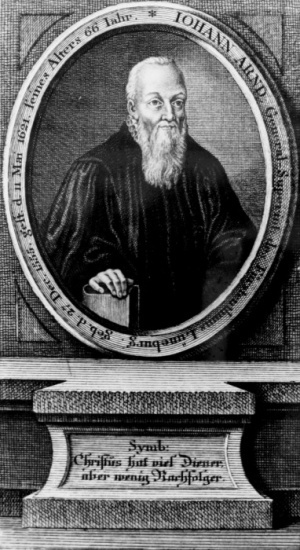 Johann Arndt was a German Lutheran theologian, churchman, and author of two devotional books of great fame: Sechs Bücher vom wahren Christentum (1605), and Paradiesgärtlein voller Christlicher Tugenden (1612), which books exerted a far-reaching influence upon the Protestant world. In a sense Arndt may be called the "father of German Pietism," which is the trend toward an inward or subjective Christianity with a strongly emotional tinge. Next to Jakob Boehme and Valentin Weigel he is also considered the most significant mystic in Lutheranism. The "pietistic" in Arndt and his followers consists in a most characteristic shift of emphasis: away from the doctrine of the "Word," that is the teaching of justification by faith alone, and the rational, orthodox theology implied in this doctrine and toward an experiential sanctification of life, a certain holiness mysticism, which is non-intellectual and untheological. There is no doubt that Arndt helped to soften the rigid Lutheran orthodoxy, and to introduce a mellow devotional element formerly strongly missing. His Wahres Christentum is an edifying reader of meditations and prayers of great emotional warmth; in the older editions the book comprises up to 1,500 pages; the Paradiesgärtlein has less than half this size. In Mennonite circles these books were widely used, replacing older, genuinely Mennonite devotional material (which was never very extensive). In fact the Wahres Christentum was the most used devotional book in German Mennonite families from about the middle of the 17th century on for possibly two centuries. With the exception of Gottfried Arnold, no Lutheran author had such enduring influence in Mennonite circles as Arndt, working for an unnoticed shift in Mennonite piety toward Pietism. Many of his books were found in Canadian Mennonite communities. It has not been known until recent a times that the Paradiesgärtlein served also as a source for the first Swiss-Mennonite prayerbook the Ernsthafte Christenpflicht of 1739. Friedmann, Robert. Mennonite Piety Through the Centuries: its Genius and its Literature. Goshen, IN: Mennonite Historical Society, 1949. Reprinted Scottdale, PA: Herald Press, 1976. Hege, Christian and Christian Neff. Mennonitisches Lexikon, 4 vols. Frankfurt & Weierhof: Hege; Karlsruhe: Schneider, 1913-1967: v. I, 85. Keeps, W. Johannes Arndt, eine Untersuchung über die Mystek im Luthertum. 1912. Winter, F. J. Johann Arndt, der Verfasser des 'Wahren Christentums' : ein christliches Lebensbild. Leipzig, 1911. Friedmann, Robert. "Arndt, Johann (1555-1621)." Global Anabaptist Mennonite Encyclopedia Online. 1953. Web. 19 Apr 2019. http://gameo.org/index.php?title=Arndt,_Johann_(1555-1621)&oldid=144745. Friedmann, Robert. (1953). Arndt, Johann (1555-1621). Global Anabaptist Mennonite Encyclopedia Online. Retrieved 19 April 2019, from http://gameo.org/index.php?title=Arndt,_Johann_(1555-1621)&oldid=144745. Adapted by permission of Herald Press, Harrisonburg, Virginia, from Mennonite Encyclopedia, Vol. 1, pp. 161-162. All rights reserved.